HCM CITY – A place where hundreds of Agent Orange victims have called home will soon close, and so far for those who are there now, they have nowhere else to live. Hòa Bình Village in HCM City’s Từ Dũ Hospital has housed victims for the last 30 years but will close this year. In 2015, the HCM City Association for Victims of Agent Orange/ Dioxine launched a project to build a new centre in Hóc Môn District that will offer rehabilitation and post-surgery care. The centre was planned to open last year and would receive AO victims including those from the Hòa Bình Village. But a shortage of funds has seen the project delayed, leaving many people worried about a roof over their heads. Major General Trần Ngọc Thổ, chairman of the association, said HCM City People’s Committee allocated a 49,000 sq.m plot to build the Orange Centre and the association called on domestic and international donors to raise about VNĐ 100 billion (US$4.3million ). Thổ said the association authorised the Agent Orange Ltd Company to collect donations and the company committed to spend about VNĐ 40 billion and start land clearance, build fencing and waste water treatment. “The company has not done anything at the project area until now,” Thổ said, adding that he did not know how much the company received from donors. Meanwhile, both Từ Dũ Hospital managers and AO victims at Hòa Bình Village are desperate for a new centre. Lê Thị Hiền Nhi, head of the hospital’s Functions Rehabilitation Department said in the last three years, the village stopped receiving more AO victims. Now, there are 35 AO victims aged between three and 38 years old, two thirds of them suffer from cerebral palsy. Nhi said the victims needed more assistance including healthcare, education, job training and orientation for their future while the hospital was able to provide them healthcare. 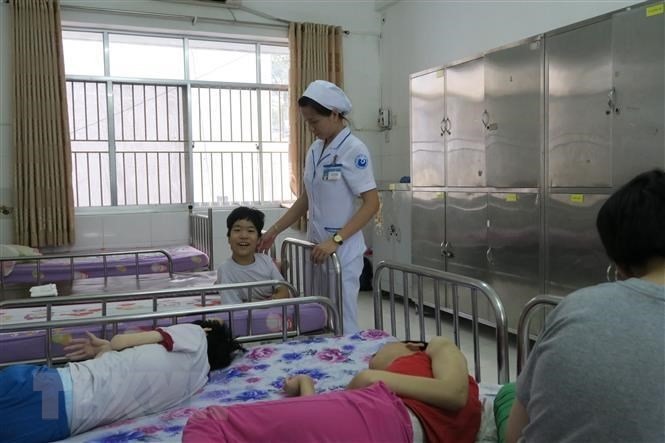 “The village is in the environment of a hospital, which is not good for the development of any child, particularly children with disabilities,” Nhi said, adding that the hospital staff wanted better conditions for the AO victims. Former director of the hospital Nguyễn Thị Ngọc Phượng who founded the Hòa Bình Village said it was not only a place where the AO victims and orphans received treatment but also their home. Phượng said she felt heartbroken to see the children who considered each other as siblings, live apart. “If only the Orange Centre could be completed as planned and the children could move to there to live together,” Phượng said, adding that she and other people were making efforts to call for donations to speed up the centre project. Trần Ngọc Sơn, vice director of the city’s Labour, Invalid and Social Affairs Department said when the Hòa Bình Village was closed, the department would take the AO victims to social sponsor centres which the department managed. The Department would discuss with the city’s Health Department and Từ Dũ Hospital about transferring procedure and time. It is not clear if the Hòa Bình Village’s children would live together or have to be separated across the city. Phạm Thị Thu Thủy, 21, is paralysed in both legs and has lived at the village for ten years. To her it is the place she calls home. “Since living in the village, I receive the love from doctors, nurses and hospital workers. I and other AO victims have a family,” Thủy said. Thủy who is a student of Special Education Department of HCM City Teacher Training University said she wished to return and teach other younger victims at the village after she graduated.